S4M is the first and only advertising technology that connects brands with consumers by bridging the gap between digital advertising and the real world. 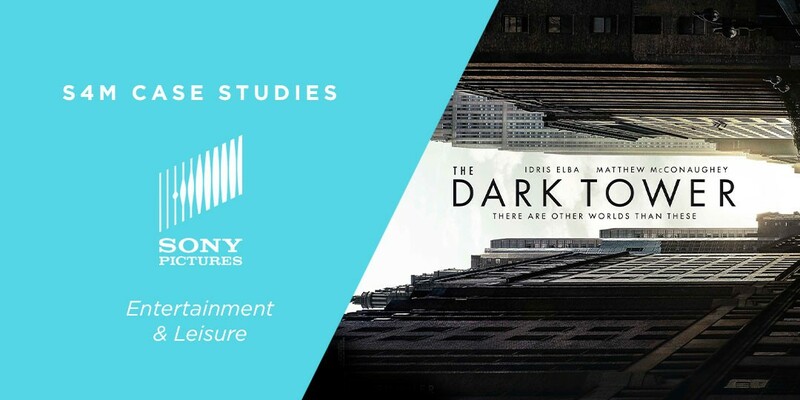 Sony Pictures partnered with S4M and IPG Mediabrands for the pre-launch of the movie The Dark Tower to generate mass awareness and encourage mobile user engagement with the movie trailer. Overall, the campaign was a success, allowing moviegoers to view the trailer, book tickets and obtain a map to the nearest location of the next showing. Movie theaters are facing stiff competition from online streaming services and other platforms. With a growing number of media entertainment sources, going to the movies is becoming less frequent than it used to be. In fact, cinema attendance saw a double-digit drop for the first time in Singapore in Q1 2017. With the increase in competition in mind, Sony Pictures rolled out the campaign in two phases. The objective in the first phase was to raise awareness before the movie release. Once the movie was in theatres, the second phase sought to make it effortless for consumers to book tickets to see the film in the nearest cinema. Underpinning the campaign’s overall strategy was the use of unique location data, available only from mobile devices, to facilitate a hassle-free cinema experience. The month-long campaign exceeded expectations by reaching roughly two million mobile users in Singapore, almost 40% of the Singaporean population. 71 thousand users watched the movie trailer in its entirety, roughly 3.55% of total exposed users. For the Video & Card creative format, over 67% of total users stayed more than 12 seconds in the format. More than 24 thousand shoppers clicked to book movie tickets after exposure to the campaign, delivering a conversion rate of 1.2%. This campaign allowed Sony Pictures to not only increase awareness but also to disrupt the typical moviegoer’s experience. With the use of the creative formats Tryptique and Video & Card, the ad seamlessly combined the movie trailer, a customized map to the nearest theater and the ability to obtain a ticket for the next showing. At the very heart of UM’s approach to campaign planning is finding and targeting the right person, at the right time, in the right moment. Of course the message needs to be completely relevant and highly addressable to what audiences are looking for. What we found really compelling about S4M’s Video End Card format was the ability to seamlessly execute the person, place, moment approach to the Sony Picture’s Dark Tower movie release and be able to follow through with a highly relevant call to action to make last-mile conversion a simple user experience. The Winner of the 2018 MediaPost OMMA Award for online marketing in the category “Movies and Entertainment”. The Winner of the 2018 Effective Mobile Marketing Awards for “Most Effective Entertainment Campaign”.